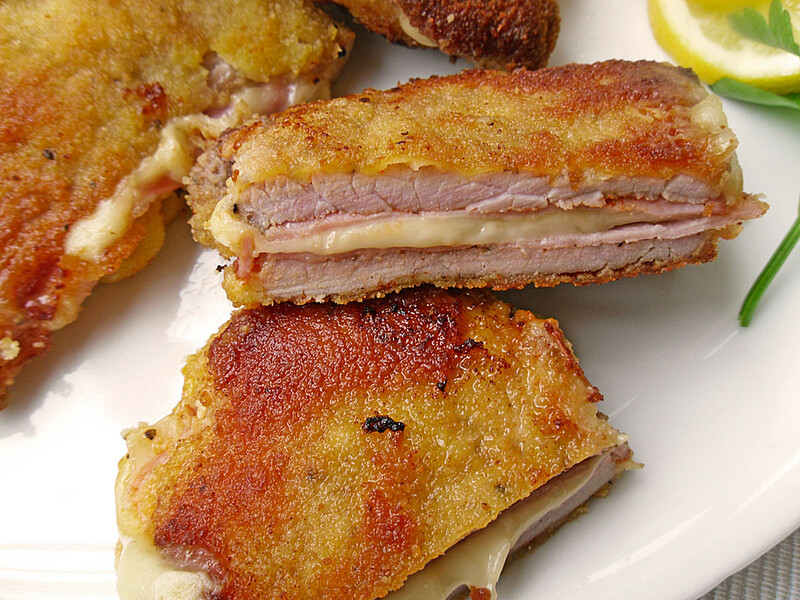 The German Cordon Bleu can be done with different meat. You can use pork, veal, turkey or chicken. But the ham and the cheese would be used for every choice, and you need to roll them - like a Wiener Schnitzel - first in flour, then eggs and finally in bread crumbs. I love it as a sandwich in between 2 slices of fresh baguette. Serve it with potato salad, vegetable mix and French fries. Happy Cooking! Paprika Powder is an essential spice in the German cuisine. The best is to use the "sweet and mild" paprika powder. - Pound the meat, wash it and pat it dry with kitchen paper. - Mix all spices, fill them in an empty jar and mix well. - Sprinkle the spice mix on every slice and side. - Place on one schnitzel a slice of ham and cheese. - Put the meat slices together and fix them with needles, the best is to use Rouladen needles, so they won't fall apart. - Beat eggs in a big enough deeper plate like a soup dish and add some of the spice mix. Mix well. - On another plate place some flour, and on a separate plate the bread crumbs. - Roll the Cordon Bleu first in flour, then in the eggs, finally in bread crumbs. - The Cordon Bleu must be covered very well with bread crumbs. - Heat oil in a big skillet and fry the meat slices from all sides, first on high heat, then reduce heat to medium. - Bring the skillet briefly to high heat, ad a small chopped onion and saute until transparent, reduce heat to medium and add 100ml red wine and 150 ml water. - Bring to a brisk boil, sieve in some flour, add salt, pepper and paprika powder to taste, bring again to a brisk boil. Serve with potato salad, French fries or fried potatoes.